The 2015 ECCO Rendezvous was held May 1,2,3 at the Marina Inn at Grande Dunes, in Myrtle Beach South Carolina. Pat Hunt chaired the 2015 rendezvous. 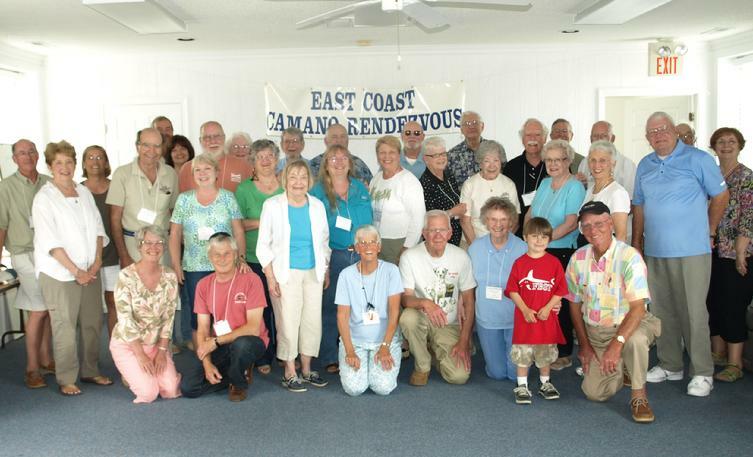 Ten current Camano Owners and six former Camano owners attended the rendezvous. Three current Camano owners attended by boat, one former Camano Owner attended by boat with the balance attending by car. Rendezvous highlights included a presentation by Paul Burbach, from Helmsman Yachts, on the new Camano 31 which is currently in production. The first Camano 31 from Helmsman will be displayed at the Baltimore boat show later this year. The rendezvous also featured presentations from Ray Smith and Brad Miller on Maintenance, Kevin Koehl on Money Saving Maintenance Tips and Camano Modifications, and Dale Paquette on Weather. A business meeting was held on Sunday. Pat Hunt was relected President, Dale Paquette was elected Vice President, and Lou Black was reelected Treasurer. Lewis Hunt will continue as bulletin board manager. Members at the meeting voted to keep the dues at $25 annually and the rendezvous fees will remain at $55. Lou Black was voted an honorary member. The 2016 rendezvous will be held on May 13, 14, 15 in the southern Chesapeake area. A specific location will be announced later. Lou Black presented a treasurers report. ECCO treasury balance on April 25, 2015 was $6,193.62 which reflected a May 5, 2014 balance of $8,590.57 plus $3,253.00 of income minus $5749.95 in expenses. Income of $3,253.00 was derived from $1425.00 in membership dues, $1708.00 in rendezvous fees and $120.00 in burgee sales. $5749.95 in expenses were derived from $1615.76 for the 2014 rendezvous, $3642.62 for the 2015 rendezvous, $203.50 for the Bullentin Board, $248.80 in burgee expenses and $39.27 in Misc Postage and Printing. 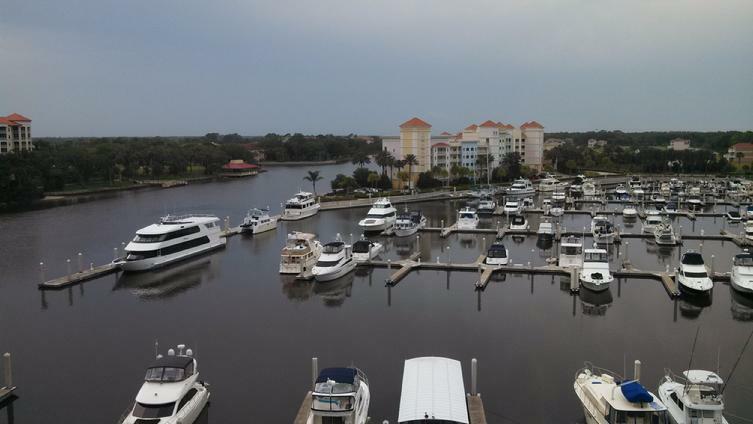 The spectacular Marina at Hammock Beach, in Palm Coast, FL was host to the 2014 ECCO rendezvous. 22 people representing 11 current and former Camano Owners attended. 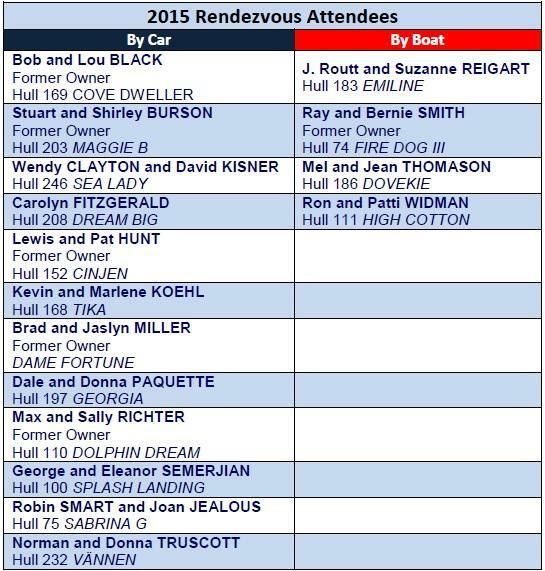 Rendezvous planners, Wendy Clayton and David Kisner, owners of Sea Lady, chaired the event held on May 9-11. Activities included a private trolley tour of St. Augustine, a potluck dinner at the marina, two days of meetings, a catered dinner, a Camano crawl and an evening dinner cruise on the Intracoastal Waterway. 5 current and 1 former Camano owners attended the rendezvous by boat. A business meeting was held on Saturday. As of May 2014, ECCO has 65 members. Pat Hunt was re-elected President of ECCO. John Lloyd was re-elected Vice President. Lou Black will continue as Treasurer. Kevin Koehl will take over as website manager and Lewis Hunt will continue as manager of the ECCO discussion forum. Pat Hunt recommended Myrtle Beach as the 2015 rendezvous location. The attendees approved the selection. Pat and Lewis Hunt will serve as 2015 rendezvous chairpersons. The dates for the 2015 rendezvous will be May 1-3. Although ECCO Treasurer Lou Black was unable to attend, she submitted an ECCO treasury report for the meeting. ECCO's treasury, as of May 4, had a balance of $8,690.57 which reflects a June 1 prior year starting balance of $6.457.74, income for the last 12 months of $5,195.00 and expenses of $2.962.17. Income was derived from dues ($25 per boat), rendezvous fees for 2013 & 2014 and burgee sales. Expenses include $2,410.09 for the 2013 rendezvous. The majority of 2014 rendezvous expenses had not yet been submitted at the time of the report. The rendezvous sessions wrapped up with a Camano crawl of attending Camano’s: SeaTrek, Movin’On, Sea Lady, Knot Busy, and TIKA. The owners’ modifications featured in the crawl are now posted on the ECCO website. The group was also treated to a tour of Ray and Bernie Smith’s Mariner 40, Firedog IV. The 2014 ECCO Rendezvous closed Sunday evening with a 2 hour Intracoastal Waterway dinner cruise on the 117 foot luxury Yacht Sundancer. Al Rossiter passed away on September 23, 2013. Al and his contributions to ECCO will not be forgotten. Thirty-six Camano owners and former owners and eight boats attended the 12th annual East Coast Camano Owners rendezvous May 17-19, 2013. It was the third Camano rondy at the Tidewater Yacht Agency in Portsmouth, VA.
Patricia Hunt of Myrtle Beach, SC, was reelected president of the organization and John Lloyd of Burgaw, NC, was elected vice president, succeeding Brian Orr of Berks, UK. Lou Black, Annandale, VA, was reelected treasurer. Lewis Hunt agreed to continue as Bulletin Board webmaster and Tom Surles, St. Leonard, MD, will succeed Al Rossiter Jr., Washington, NC, as web site manager later this year. In her report to the membership at ECCO’s business meeting May 19, Pat Hunt said ECCO had 64 boats represented at the time of the meeting, including those who previously owned eight Camano 31s. Thirteen Camanos whose owners were ECCO members were berthed in Florida, seven in North Carolina, six each in Virginia and Maryland, five in Canada, three each in Massachusetts and South Carolina, two each in New York, Oregon and Pennsylvania and one each in Alabama, California, Connecticut, Georgia, Illinois, Michigan, Minnesota, Nevada, New Hampshire, Ohio, Rhode Island, Vermont, Washington, Wisconsin and Sweden. Black reported that ECCO’s treasury, as of May 15, had a balance of $8,471.71, with a total income for the past 12 months of $12,506.42 and expenditures of $4034.71, including last year’s rendezvous expenses of $3,184.81. After considerable discussion, it was decided to consider Florida as the site for next year’s rendezvous. Wendy Clayton volunteered to explore the marina at Hammock Beach Resort in Palm Coast, FL, as the site for the 2014 rondy next spring. Clayton and David Kisner keep their Camano, Sea Lady, at Hammock Beach, which is located south of St. Augustine and north of Daytona Beach. Rossiter reported at the meeting that ECCO’s web site generated 8,207 page views in 2012, up from 6,188 in 2011 and 4,717 in 2010. Rossiter will turn web site responsibilities over to Surles later this summer. The rendezvous, which was chaired by Jean Thomason of Asheville, NC, got underway Friday evening, May 17, with cocktails and a pot luck dinner. Bernie Smith of Chester, MD, made needlepoint napkin holders, which were presented to the owners of each boat. Saturday’s meeting featured a session led by Kisner on Internet resources and applications for boaters; and a hands-on demonstration of gelcoat repairs by Larry Woods of All Seasons Marine Repairs. After a barbeque dinner, ECCO members were entertained by The Town Point Sea Shantiers. Several members described their favorite cruising destinations at the opening session Sunday moderated by Stuart Burson, Autaugaville, AL. Robin Smart of Washington, NC, led a discussion later Sunday morning on what and what not to do when docking. Jean Thomason and Clayton led docking practice in the marina for women Sunday afternoon while most men remained in the meeting room for a technical question and answer session. After the business meeting and a group picture, most ECCO members visited boats of attendees and then gathered for dinner at the 757 Crave restaurant in the marina. Forty-five people and 10 boats gathered along the Trent River in New Bern, NC, May 18-20 for the 11th annual Spring rendezvous of East Coast Camano Owners. Pat Hunt, former Camano owner from Myrtle Beach, SC, was unanimously elected president at the rondy’s business meeting, succeeding Al Rossiter Jr., Washington, NC, who retired after serving as ECCO president for five years. Hunt helped form ECCO in 2001 and was its first president. 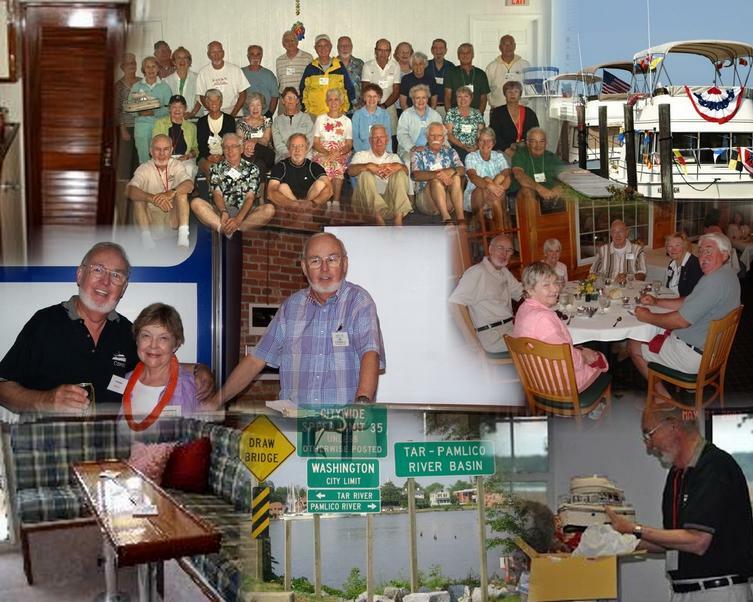 Brian Orr, a British citizen who has been cruising with his wife Jean in the United States and Canada for three years, was elected vice president, succeeding Paul Martin, of New Bern, who decided not to run for reelection. Lou Black of Annandale, VA, was reelected treasurer. Lewis Hunt was reelected manager of ECCO’s Internet bulletin board. In his report to the membership, Rossiter said that ECCO had 65 paid-up members at meeting time and seven members who had not yet been heard from. (Each Camano, or previously owned Camano, counts as one member.) Florida had the most ECCO members, with 13. There were 10 in North Carolina, six in Maryland, five in Virginia, four in Massachusetts, and two each in South Carolina, Rhode Island, Michigan, New York, and Minnesota. There also were ECCO members in California, Nevada, New Hampshire, Washington, Connecticut, Vermont, Georgia, Alabama, Pennsylvania and Ohio. Four ECCO members were in Canada, one in Sweden and one in the United Kingdom. Black, in her treasurer’s report, said as of May 15, ECCO’s treasury had a balance of $8,610.42. The group had a total income of $13,574.78, from dues ($25 per boat), rendezvous fees and burgee sales. Expenses totaled $4,964.36, including rendezvous expenses, bulletin board, web site and burgees. At the meeting, the membership presented Rossiter with $500 to be donated to a charity of his choice. Bob Black said the donation was in recognition of Rossiter’s years of service to the East Coast Camano Owners. Bernie Smith, Chester, MD, also gave Rossiter a large needlepoint model of the Camano 31. She made the model and also needlepoint light houses, which were given to each person attending the rendezvous. After the rendezvous, ECCO's new officers sent Bernie Smith an arrangement of flowers as a token of appreciation from ECCO members for her continuing support of the organization as well as her needlework gifts. To begin the rendezvous festivities, ECCO members gathered on the docks of New Bern Grand Marina Friday evening for a reception. 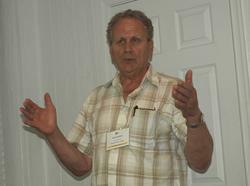 Martin, who served as chair of the 2012 rendezvous committee, opened Saturday’s meeting at Capt. Ratty’s restaurant and then the group boarded two trolley buses for a 90-minute tour of the historic North Carolina river town. The group had dinner at Capt. Ratty’s second floor meeting room and then Dale and Donna Paquette of Portsmouth, entertained the group. Following a second Camano “crawl,” during which ECCO members visited other Camanos to look at owner modifications and other changes, on Sunday, the group moved to the New Bern Yacht Club. Martin and Ray Smith, of Chester, MD discussed the electrical systems aboard the Camano 31s, and then attorney Jason R. Harris of New Bern, gave a presentation on admiralty law. After the business meeting, the group had a catered barbecue and chicken dinner. Margin Call -- Jeff Edwards of Greenville, NC, daughter Katie and son Spencer. Knot Busy – John and Lee Lloyd, of Burgaw, NC. Cameo – Paul and Pat Martin, New Bern, NC. Fire Dog IV – Ray and Bernie Smith, Chester, MD. Relax – Tom Surles, Adrian Holmes and Tom Lewis, St. Leonard, MD. Other members attending the ECCO rendezvous: Bob and Lou Black, Annandale, VA; Stuart and Shirley Burson, Autaugaville, AL; David Kisner and Wendy Clayton, Midway, GA; Wayne and Suzy Cross, Merritt Island, FL; Richard and Norma Erth, Palm City, FL; Lewis and Pat Hunt, Myrtle Beach, SC; Dale and Donna Paquette, Portsmouth, RI; Greg and Lantha Quesenberry, Abingdon, VA; Max and Sally Richter, Malvern, PA: George Semerjian, Lottsburg, VA; Mel and Jean Thomason, Asheville, NC; and Norm and Donna Truscot, Bristol, RI. 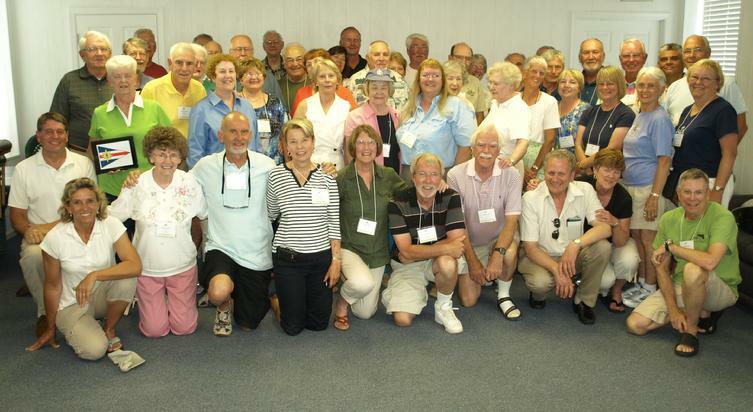 Some of those who attended the 2012 rendezvous. Bob Warman, the designer and original builder of what now is called the Camano 31, started out nearly a half century ago designing and building race cars. In 1970, he switched to boats. Speaking at the 2011 East Coast Camano Owners (ECCO) rendezvous May 21 in Portsmouth, VA, Warman said that in the early 1980s, there seemed to be an interest in the power boating community for two types of boats -- an ocean-crossing power boat and a coastal cruiser that would go 12 knots. He said a lot of boats would go 12 knots, but he said it was difficult to do that efficiently. One way to do that, Warman said, would be to build a long, narrow hull, but that would lack the stability desired in a cruising vessel. "So I started thinking, what if we inverted the concept and we put a long, narrow hull down the center under the water and put a planing surface on each side so we could get through the 12 knot speed barrier and do it efficiently." Warman, who lives in Okotoks, Alberta, Canada, said he designed a 34-foot boat on that concept and built a 1-8 scale model that demonstrated the idea worked. He called this unusual underbody a "keel form hull." To be successful in the marketplace, Warman said he believed the boat needed to hold its value and be simple but of high quality. He decided on a work boat style because the design didn't age and wanted a diesel-powered boat with a single propeller, and to make a bow thruster standard to aid in maneuverability in docking. Another goal, Warman said, was to keep the price under $100,000 in 1989 dollars. That meant a 34-footer would be too big, so he reduced the size to 28 feet on deck (31 feet overall) and decided to build it in fiberglass. He called the boat a "Troll" based on the rugged trollers that fished the North Pacific for salmon. The first four Trolls had four-cylinder, 130-horsepower Volvo diesels and Warman said they would go 17 knots unloaded. Starting with the fifth Camano, Warman added a six-cylinder Volvo that produced 150 horsepower. Volvo later upgraded the engine to produce 200 horsepower. Warman and his wife Dora built 72 Camanos near Vancouver before selling the company to Brad and Jaslyn Miller in 1997. "I've always thought a boat was a success if it's not resold a lot and if they hold their value," Warman said. "From the first boat Camano built until eight years later, there was never a boat resold. So I think that means it was a success." The Millers continued to build the boat in Delta, British Columbia until 2007. It is now being built in Anacortes, WA by Camano Yachts America. Warman was the primary speaker at ECCO’s tenth anniversary celebration. 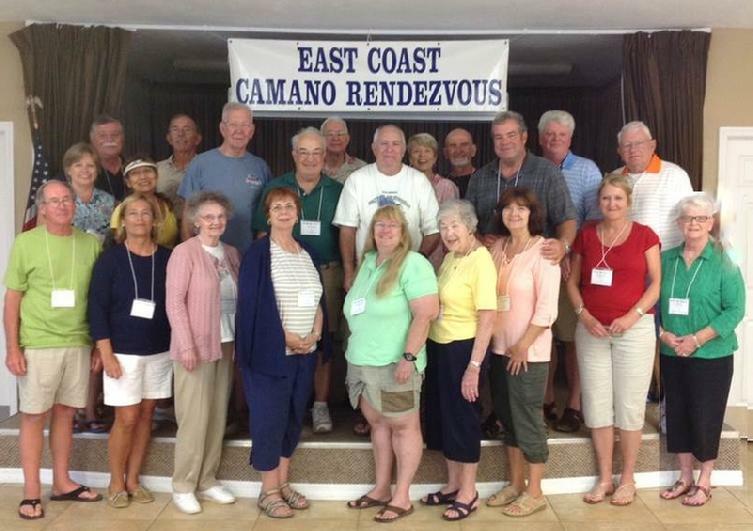 Thirteen Camanos attended the rendezvous at Tidewater Yacht Agency's marina in Portsmouth, along with 52 ECCO members. 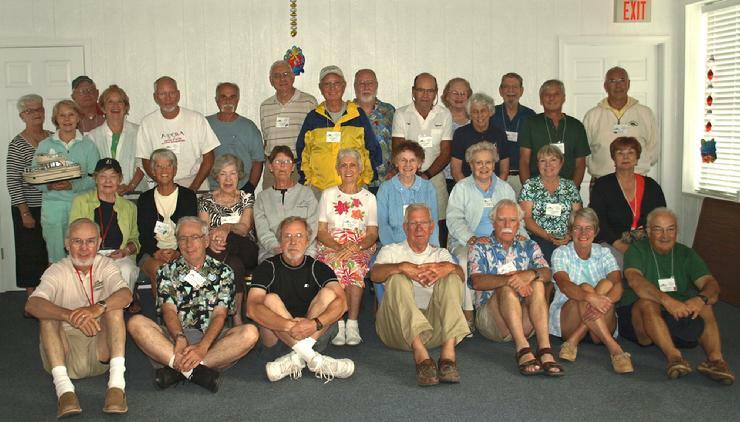 Some of those who attended the 2011 rendezvous. Lady In Red Leaves Factory in Anacortes, WA. The first Camano 31 built in the United States has been delivered to a couple from Ferndale, WA. Paul Burbach, a principal in Camano Yachts America, of Chester, Md., said earlier that the company planned to begin construction of two Camano 31s as demonstrators in Spring 2011, but he reported in February 2012 that no boats were in the works due to the economic environment.
" I hope that will change in the near future," Burbach told East Coast Camano Owners (ECCO). The new Camano 31 was built in Anacortes, WA. A total of 269 Camano 31s were built in Canada from 1989 to 2007. Camano Yachts America acquired the Camano name, tooling and design in early 2008 and moved production to the United States. 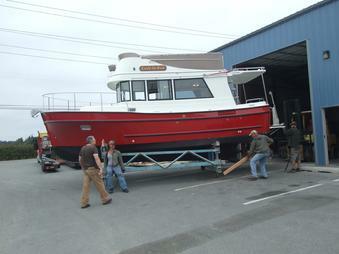 The first Camano 31 (designated as hull 301) produced in the U.S. is named "Lady In Red." It was launched in August 2011. Unlike the standard ivory-hulled boats, the new Camano has a red hull and several changes, including improved bridgedeck drainage, a larger holding tank, a mounted helm seat that drops to the side of the cabin when not in use, a companion seat, and a hard-top cockpit cover. 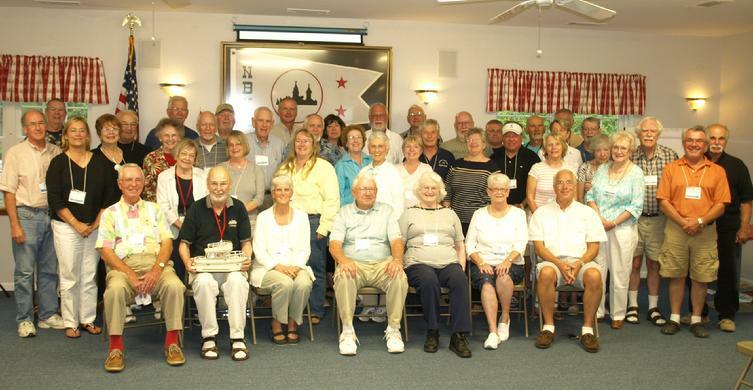 Some of the folks who attended the 2010 Camano Rendezvous in Portsmouth, VA.